The Goldrush complex is a Carlin-type sedimentary rock-hosted disseminated gold deposit located in the Cortez mining camp on the Battle Mountain-Eureka mineral trend, Nevada, USA. Goldrush is the third giant gold deposit (more than 300mt or 10 Moz gold) discovered in the district after Pipeline and Cortez Hills and brings the total endowment of the Cortez camp to greater than 50 Moz gold. The discovery was the product of major advances in geologic interpretation and exploration focus in the Cortez district in the early 2000s. Stratigraphic studies based on field observations resulted in greater understanding of the carbonate shelf/slope facies host rocks in the district, which in turn led to new concepts of structural controls on mineralization. Remapping of the historic open pits and surface geology of the Cortez Window and relogging of selected drill holes provided additional support for reinterpreted structure and stratigraphy and the construction of new geologic models. Initial drill testing in the Horse Canyon area led to the discovery of the Red Hill system in late 2004 with an intersection of 61m @ 8.2 g/t gold (375m depth). Subsequent drilling in 2006-08 established continuity and expanded mineralization in the Red Hill area. In late 2009, a new discovery hole located around 1.7km south of the original Red Hill area intersected 20.5m @ 30.6 g/t (388m depth). This new discovery (Goldrush) together with Red Hill were the objects of a consistent, focused drilling effort coupled with geologic modelling; this program demonstrated that Goldrush was continuous with Red Hill and the entire system was renamed the Goldrush complex. The end of year 2013 resource for the Goldrush complex stands at 75.5 mt @ 4.52 g/t measured and indicated resources for 10 Moz gold, with an additional 39.5 mt @ 4.82 g/t for 5.6 Moz inferred resource. The system remains open in multiple directions and exploration is ongoing. Nathan is a project geologist with Barrick Gold Exploration working on the Goldrush deposit. He graduated with a B.Sc. in geology from University of Wisconsin-Madison in 2008 and a M.Sc. 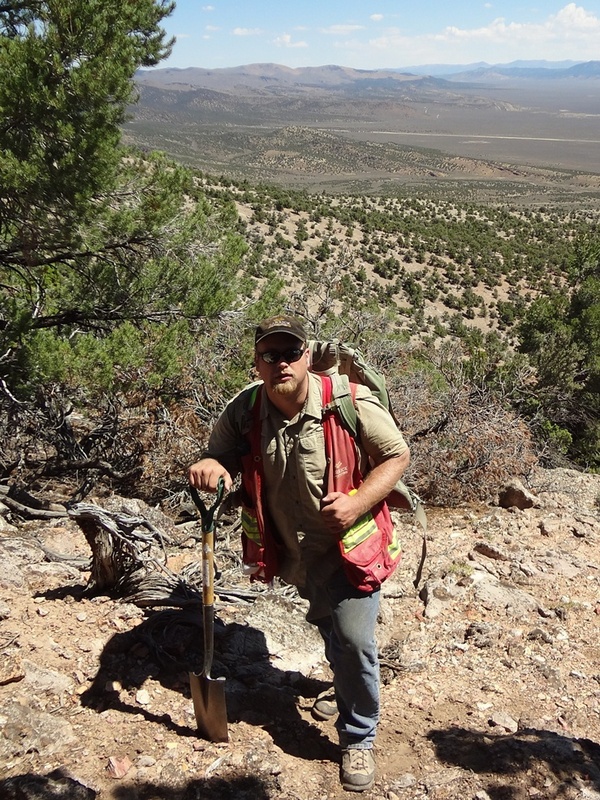 in geology from University of Nevada-Las Vegas in 2010. Nathan began working with Barrick Gold Exploration in 2010 at the Goldstrike property. He has since worked on a variety of projects exploring for Carlin-type deposits ranging from grassroots exploration to near mine exploration. Last fall he began working with the exploration team on Goldrush, and most recently has been involved in modeling the stratigraphy and structure at Goldrush.